A London ‘ePrix’ has hovered at the bottom of the Formula E calendar since the all-electric single-seater series first sparked into life, but legislative red tape being what it is in the UK, we wondered whether a race in the capital would ever see the light of day. Now, with the help of mayor Boris Johnson and enlightened souls at Wandsworth Council, we look forward to not just one, but two. Formula E will finish its inaugural season with its first double-header on June 27/28, each day featuring a race around a 15-turn, 1.8-mile circuit laid out in leafy Battersea Park. Whatever you might think of the series so far, it’s an exciting prospect. Battersea Park is a 10-minute stroll from Motor Sport’s Thames-side office in Chelsea, so we couldn’t resist a trip across the river to complete a recce lap among mid-week dog walkers and joggers. As we’d anticipated, the perimeter road is hardly Melbourne’s Albert Park, but in our mind’s eye it should make for challenging and spectacular motor racing. Shades of the old Crystal Palace, we’d suggest – albeit lined by the inevitable safety-conscious concrete walls and sky-high catch-fences. Such plans are the stuff of our daydreams – but can this really be an FIA-standard reality? 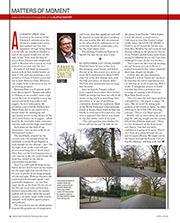 The start/finish, situated on the circuit’s only real straight beside the landmark riverside Peace Pagoda, is wide enough for two abreast – just – but the high crown in the road will give drivers something else to think about. Then there are the low-hanging trees, a rare concern in the city-centre tracks the series has created so far, but an unavoidable hazard here. Turn 1 is a left-right flowing sweep before drivers will be hard on the brakes for the super-tight and narrow Turn 2. It’s easy to predict front wings pinging off left and right. Without chicanes, the track would be seriously quick – and potentially dangerous – so two ‘bus stops’ break up the flow. On the site of the first sat circus rides on hard dirt, between immovable trees (we assume asphalt will be laid), while the second crosses a car park, single width in part, complete with shallow speed-calmers and potholes. The convoluted, narrow infield pitlane required the greatest use of imagination and it was clear that significant cash will be required to make the place anything like race-worthy. But still, we returned to the office fired by enthusiasm for an event that should be unmissable, even for the most ardent cynic. The clashing Goodwood Festival of Speed? I’m sure we can miss a year. By September last year, Harry Tincknell knew he was in line for a life-changing career break, well before the end of his first season as a sports car racer. 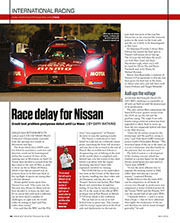 He’d anchored a Le Mans LMP2 class win at his first attempt and, with the help and advice of mentor Allan McNish, that momentum was carrying him forward. 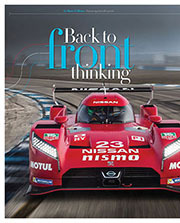 Since its launch, Nissan’s radical front-engined, front-wheel-drive hybrid LMP1 prototype has been the talk of the motor racing world as something truly innovative in an age of stultifying conformity dictated by regulation. Back at the World Endurance Championship round in Austin, Harry knew he had one hurdle to overcome to be a part of it – but now it appeared that barrier was about to trip him within reach of his goal. A week after the announcement, Tincknell is still in “pinch me” mode as he describes his initial impressions of a car that has set us all wondering. Will it work? A straightline session in South Carolina has been a prelude to two evenings of running at the Floridian West Palm Beach circuit. It is said Michelin has already progressed to softer rubber following initial tests, perhaps an answer to doubters’ warnings of excessive tyre wear, while predictions of eye-popping top speeds on the Mulsanne could hint at a shot at pole. 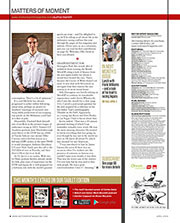 Meanwhile, Tincknell finds himself one of six Brits in the premier league of endurance racing in 2015. Nissan’s GT Academy graduate Jann Mardenborough joins Harry in the GT-R line-up, while at Toyota Indycar race winner Mike Conway enters his first season as a full-time LMP1 jockey, in the sister TS040 to world champion Anthony Davidson. 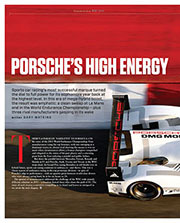 GT racer Nick Tandy gets the call to the 919 Hybrid over at Porsche, and then there’s Oliver Jarvis at Audi. At 31, Jarvis is no rookie. 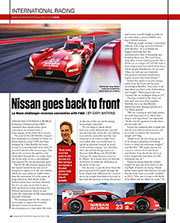 With two Le Mans podium finishes already under his belt, plus years of experience via the DTM and Japan, he is well prepared for a full-time ride with the world’s greatest sports car team – and I’m delighted to say he’ll be telling us all about life at the endurance racing coalface this year through the pages of this magazine and website. 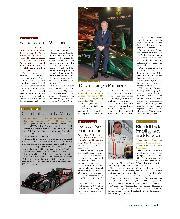 Oliver joins us as a columnist, and you can read his first contribution on page 42. Welcome, Olly. Great to have you aboard. Disappointment for Donington Park this month after it withdrew from running the British MotoGP, citing a lack of finance from the new rights holder for whom it would have hosted the race. That’s because the Circuit of Wales doesn’t yet exist. A new deal with Silverstone as surrogate host thus ensures the race returns to its most recent home. Still, Donington was hardly relying on MotoGP to continue its remarkable regeneration under Kevin Wheatcroft, who I met this month for a chat (page 116). I saved a post-script question for the end, inspired by a reference in his late father Tom’s autobiography Thunder in the Park. Apparently, as a young lad, Kevin met Elvis Presley in Las Vegas. I had to know about that. Kevin smiled: “That was a 20-minute personal meeting of which I can remember virtually every word. He was the most amazing character. He seemed to know everything that was going on, even though he was not in the world we were in. He knew all about F1, which was unusual for any American.